The first mention of Andhras is found in the Aitereya Brahmana. Clear sources for Andhra history are traced from the Satavahana Period, Le. 2nd or 3rd Century B. C. From then on the identity of a composite Andhra culture seems to have emerged under the influence of several streams of tradition from time to time. Buddhism, Jainism, Veera Saivism, Vaishnavism and Vedic culture contributed to this evolution in their own way. Though the political, economic and cultural history of Andhra society is traced from the beginnings of Christian era, the first Telugu inscription dates back to 575 A. D. and the first available literary work in Telugu to 11th Century A.D.
Each cultural tradition leaves its impact on the lifestyle, world-view, behavioural norms, arts and literature of a society. Aim of this paper is to study the impact of Jainism on the culture and litrature of Andhras in general. There are a few important points to be kept in mind while studying the influence of Jainism on Telugu (Andhra) society. The foremost of them is that the total assimilation of a strong stream of Jainism into Telugu culture, without leaving any traces of distinctness, got completed by the end of 13th Century. Upto this point of time this Jain cultural stream had a relatively more vibrant existence in the Telangana and Rayalaseema regions of Andhra Pradesh in contrast to the coastal belt which was relatively under a stronger impact of Buddhism and Vedic culture from time to time. The third significant observation is that the impact of Jainism on Telugu literature is not as directly traceable as in the case of Telugu culture. While powerfully penetrating into the cultural fabric of Andhras, Jainism seems to have been less aggressive in their region, Through its soft penetration Jainism left several significant traces on the history of the Telugu people. Even today the art and architecture of Jains can be identified in the ancient temples and other structures in the Andhra region as the reminders of the glorious past of Jain culture in this part of the country. Even with regard to. the impact of Jainism on Telugu literature a few interesting observations may be taken note of: (a) only a few evidences of Jain literature in Telugu are available. There are a few indications that the same poets who are known to have produced Jain literature in Kannada made attempts to produce similar works even in Telugu. (b) Jain literature in Kannada indirectly led to the evolution of certain significant genres of Telugu literature. I shall try to elaborate these points further in this paper. (1) The Jain Period of Andhra History: Going back to beginnings of Andhra history of the patronage of Kharavela, the King of Kalinga to Jainism was a mangnanimous beginning for the spread of Jainism in "the Andhra region. Jainism during this period could successfully survive facing the hostile Vedic and Buddhist traditions. In between 265 and 625 AD. Jainism flourished in the Tatikonda of East Godavari and Hanumakonda of Telangana regions. The Vemulavada Chalukyas were the next important patrons of Jainism in the Andhra region. It is to be noted here that it is these Telugu kings, especially the Arikesari I, who patronised the poets Pampa and Ranna who composed the Jain literature of Kannada. Certain historians believe that Pampa and Ranna rendered a few Jain works in Telugu which are not available today, Among the eastern Chalukyas Vishnuvardhana III made donations to the Nadumbi Jain Vasati at Bejavada. The Jainacharyas of this Vasati belong to the Kavururi Gana. Ammaraju II also made several donations to Jinalayas (Jaina temples). The Valahari Gana, Kotimuduva Gana, Addakali gaccha, Nandigaccha congregations of Jainism find their mention in the inscriptions installed by this King. The dynasty of Pandaranga, the famous General of Gunaga Vijayaditya, was a Jain dynasty. They were the hereditary rulers of Katakam. Duggaraja, the great-grandson of Pandaranga constructed the Katakaabharana Jinalaya. It is to this temple that Ammaraju donated the Village Malayapudi. Duggaraja was the Rajavishayaadhyaksha (the political head) of the Karma Raashtra. The Kakatiya rulers before Betaraju II were all the followers of Jainism, Betaraju II was the first Kakatiya king to get converted into Veerasaivism. His successors followed his suit stopping the royal patronage to Jainism in the Kakatiya empire. One of the most ancient Kakatiya constructions, the Padmakshi temple, was a Jain temple to begin with. It was constructed during the reign of Prolaraju II. Mailama, wife of the minister Betana constructed the Kadalalaya Vasati on a hill at Hanumakonda. A Digambara Jaina idol is carved in one of the stones on the hill itself. Even inside the temple of Padmakshi we can see the idols of Jaina Teerthankara and Yakshinis. But after Kakatiyas toqk to Veerashaivism this temple got converted into a shakti temple. After the loss of patronage from Kakatiya. kings, Jainism waged a vain battle against the hostile traditions of Veerashaivism and Vedic culture and gradually became extinct from the main stream of Telugu culture. But this long existence of a soft but vibrant tradition lift its own indelible marks on the Telugu culture. (2) Traces of Jain Culture in Today's Telugu Life : There are certain imprints of Jain culture without understanding which it is difficult to explain several features of Telugu culture even today. Some of these are very often mentioned by scholars, They are: the word 'bastl' for 'big town' in coastal areas and for localities within a big township' in Telangana areas, is derived from the Jain word 'basatl' (vasati). The sacred phrase which is made to be written by a Telugu child while starting his script learning or his studies in general is 'Om Namassivaya Siddham Namaha', Some scholars opine that the second part of this sacred sentence, viz., 'Siddham Namaha', is actually a reminiscence of Jain culture. This Telugu word for multiplication tables is 'ekkaalu'. This is actually derived from the first word of the first multiplication table in Praakrit starting as 'ekka sa vaggo ekka', once brought in to vogue by Jain aacharyas in the Telugu region. Astrologically, Telugu people prefer to treat 'varjya' as the 'bad' time of the day in contrast to the Raahu kaala followed by the other south Indian people. Varjyam is a Jain convention. Some other such interesting imprints are found in the caste names and place names. One such interesting caste name is 'Komati' which is the native Telugu word for the Vaishya or the merchant community (caste). This word is derived from the word 'Gomathi' which means the followers of Gomatheswar. This might indicate the widespread prevalence of Jainism among the native Telugu merchants at a certain point of history. 'Muni' is a word which is found in several place names such as Munipalle, Munikonda, etc. This word 'Muni' might refer to the Jain munis. The most interesting reminiscence of Jain culture on the Telugu region is the stone images called 'sanyasi devullu'. These images in Kayotsarga posture are actually Jain images but today they are worshipped by women desirous of progeny. Some historians believe that the ritual vows of fasting, annadaanas (food offerings) and gosaala maintenance were popularised by Jains in the Telugu region. There are many archaeological sites in the Andhra region where reminiscences of alchemical experiments are preserved with mystic sculptural and iconic codes. These alchemical practices were mostly in vogue among the Jains. (3) Jainism and Telugu Literature : Though Jainism continued its dynamic existence in the Telugu region up to the middle of the 13th century A. D., i.e. for 300 years later to the beginning of independent literary works in Telugu, it is stfimge to see that we cannot find any Jain literature as such composed in Telugu. It is said that the same poets who composed Jain literature in Kannada rendered a few Jain works in Telugu too. But unfortunately none of these works is available today. When we say that there is no Jain literature in Telugu, we only mean that there are no Telugu works composed for the propagation of Jainism. In fact, there are three important Telugu books of the ancient time which are associated with Jainism. They are: (1) Pavuluri Mallana's Ganitam, (2) Malliya Rechana's Kavijanasrayam (a book on Telugu prosody) and (3) Adharvanacharya's Adharvana Kaarikaavali which is a commentary on Aandhrasabdachintamani, a Sanskrit book of verses on Telugu grammar. 'Ganitam' is the Telugu rendering of an original Jain Prakrit work on Mathematics. But the author of the Telugu version, Pavuluri Mallana, is a Veerashaivite. But still a few examples related with Jain culture may be found in this book. , Kavijanasrayam' 's authorship is controversial. Some of the verses are found addressed to one Malliya Recha. 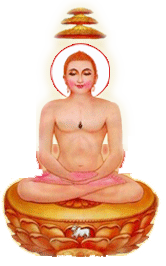 This Malliya Recha is identified as the author of the book by some scholars and he is identified as a Jain. But even this work is not directly related with Jainism as such, though a few examples in this book refer to Jain culture. Adharvanaacharya is known to be a Jain aacharya and is said to have composed a few portions of the Mahabharata in Telugu after Tikkana had done the same work from a Vedic point of view. Whether Adharvanaacharya's rendering of the Mahabharata was done in Jainist lines or not is not known because his composition on the Mahabharata is not available. Telugu people seem to have been acquainted with the Jain (and Buddhist) versions of the Ramayana (may be even of the Mahabharata). Certain proverbs which are in vogue even today among Telugus give this indication. For example, there is a proverb which means "It seems someone asked what is the relation of Sita to Rama after listening the story of the Ramayana the whole night". This proverb might be referring to the confusion about the relation between Rama and Sita the Jain Ramayana creates in the minds of the people who already know the Vaalmiki version of it. (There is a similar proverb which refers to the Buddhist version of the Ramayana.) Telugu language seems to have strangely preserved the people's memory of a literary works while the work itself is actually lost in course of history. The indirect impact of Jainism on Telugu literature through the interaction of Telugu literature with Kannada literature seems to be very significant. It is actually the inspiration from this Kannada Jain literature that led to the origin of the first available independent Telugu literary work, viz., Nannaya's Mahabharata. Some scholars go to the extent of saying that the structure of Telugu Kavyas, their champu (verse and prose) form, the choice of metres (like Utpalamala and champakamala), the metre called Kandam, the Avataarika or the prefatory structure of Telugu kavyas, etc. are all Jain contributions. But in fact, these purely literary aspects of Telugu kavyas, though have their origin in Kannada literature, might have nothing to do with Jainism as such. But direct conflict and competition between Veerashaivism and Jainism had led to a strong impact of Kannada literature on the Shaiva literature in Telugu. For example, the concept of 'Vastu Kavita' found in Nannechoda's Kumaarasambhavam and the nativity consciousness expressed .through the notions of Desi and. Jaanu Telugu in the Shaivite literature are all a few examples for the imitation of the rival Jains by the shaivite poets. One of the most striking consequences of this 'imitation of the rival' by Shaivite poets is the emergence of a genre called 'Puranam' under the infuence of Jaina Purana structure of the Kannada works composed by poets like Pampa. 'Basavapuranam" is the most typical example for this interesting impact of Jainism in the origin of a 'Desi' (native) genre in Telugu literature. The next and last section of this paper is devoted to elaborate this significant impact of Jain literature on Telugu. (4) The Influence of Jaina Puranas on the Structure of 'Basava Purana' of Palkuriki Somanatha : Basava Purana of Palkuriki Somanatha was the first Desi Purana in Teluge literature. It was composed in Desi metre Dwipada in the latter half of the 13th century. This work was acclaimed as the landmark in the evolution to Desi tradition in Telugu literature. Though Somnatha's work was called a Purana, it does not belong to the Marga tradition of Purana literature. Many a critic in Telugu has tried to interpret Basave Purana by applying the principles and characteristics of the Maha Purana tradition of Sanskrit and has failed in his endeavour. On the other hand, a few others tried to portray this work as a Kavya in the garb of a Purana, but they were not successful either. No attempt has, however, been made to study the Purana as a form in the Desi tradition and the impact of the various trends and experiments, which were popular in South Indian languages, on the structure of the Puranas. The impact of Veerasaivism, the teachings of Basava and the literary trends of Kannada literature of Palk Uriki Somanatha are historical facts. Actually, the Telugu poets of the 11th, 12th and 13th centuries worked under the powerful influence of Desiexperiments carried out in kannada literature, though some of them had opted for the traditional forms of Sanskrit literature. Palkuriki Somanatha was the first poet in Telugu who took up the form of the Desi Purana as a challenge in the pursuit of creating a classic within the Veerasaiva literature. Dasava Purana mainly deals with the life of Basaveswara-- the incarnation of Basava, and his Divine Miracles along with various stories of Saiva devotees. Basava Purana is the first Purana of Veerasaivism in Telugu; it was and still is the sacred book for the Saivites. Palkuriki Somanatha has collected the source material for his theme from various Desi literary forms of oral tradition in Kannada and Telugu. The main sources are the legendary songs depicting the stories of ancient devotees of Siva and Basava (Narayana Rao: 11). Hence, this Purana is not a translation of any work. Palkuriki Somanatha has woven the plot of the Basava Purana from the source fabrics of oral tradition with his own skill and imagination. Basava Purana was writeen in seven chapters as follows: Nandikeswara's incarnation as Basaveswara, rejecting the Upanayana in favour of 'Veeramaheswara Vrata'; Basava's marriage and his surrender to Sangameswara, are described in the first chapter. Basaveswara's initiation as a minister in the court of Bijjala; Kalyanakataka and his divine miracles are the main contents of the second chapter. The narration of the stories of Mugdha Bhaktas by Basaveswara to Channa Basava occupies a major portion of the third chapter. Stories like that of Madivalu Machaiah and some stories about ancient Saiva devotees are the main subject matter of the fourth chapter. Stories of the contemporary devotees of Basaveswara form themselves into the fifth chapter. The sixth chapter deals with the stories of Ekanatha Ramaiah and others. The seventh chapter concludes the' narrative with the merger of Basaveswara with Sangameswara, the assassination of Bijjala and the decline of kalyanakataka. If we observe the contents of the Basava Purana, we can easily come to the conclusion that this work does not reflect any characteristics of the Puranas of the Marga tradition. The Basava Purana, in its structure, has the inherent characteristics of Jaina Puranas of Kannada literature. Jaina Puranas mainly described the life and divine powers of the Thirthankaras who attained salvation through Jnana. The Jaina poets translated Sanskrit and Prakrit Puranas into Kannada, between 940 and 1140 A.d., which is generally called 'the age of Pampa' in the history of Kannada literature. These Puranas have become very popular. Very eminent poets like 'Ratnatraya' have contributed to this stream of literature. 'Aadikavi' Pampa (latter half of the 10th century) had written Aadi Purana, the story of Purudeva, the first Jaina Thirthankara, in Chempu style. It was a Kannada rendering of Jenasena's Sanskrit work. 'Ubhayakavi Chakravarthi' Ponna had composed the story of the 16th Jaina Thirthankara as Santhi Purana. 'Kavichakravarthi' Ranna had written the life story of the second. Jaina Thirthankara as Ajitapurana. In addition to these works we find many puranas in Kannada like Mallinatha Pur ana of Janna, which were popular among Jains. In Tamil literature the Periya Purana of 'Shekkizhar'. which contains the stories of Saiva devotees known as 'Aruvathumuru Nayanars', has become very popular. All these experiments suggest that the literary form of Purana in Jaina literature in Kannada and Saiva literature in Tamil has the chief characteristic of depicting the life story of a religious preacher (Mathacharya), this central narrative being supported by various stories of a number of devotees. This popular feature of Purana of 10th century A. D. is different from the Sanskrit Maha Purana tradition. Basava Purana followed the Desi tradition instead of Maha Purana of Marga tradition and became popular as the first Veerasaiva Purana in Telugu. 5. Parinirvanamahotsava or Parinirvana Kalyana. These five utsavas or kalyanas are the five stages of elevation in the divine life of a Jainathirthankara from his birth to his liberation. Jaina Puranas have gained a sacred status in literature with these five qualities. (2) Two more qualities are very familiar in Jaina Puranas. They are: Bhavavali and the stories of Sixty-Three Salaka-mahapurushas (Thrishashti Salaka Maha Purushas). The description of the previous births of Thirthankaras in order is called Bhavavali. In Jaina Philosophy it is believed that the Jeevatma, while attaining Jnana, ascends from lower birth to higher birth and finally attains Jnana-siddhi, which leads to the birth of a Thirthankara. Against the characteristics of Sarga and Prathi Sarga, at the beginning of Maha Puranas Bhavavali adorns the first part of Jaina Puranas. Hence. Bhavavali is the prologue of the main story of a Thirthankara, the hero of Jaina Purana. According to Jaina tradition there were 63 Salaka Purushas who followed Jaina Dharma and attained Salvation. They were called Thrishashti Salaka Maha Purushas. They are different from the 24 Thirthankaras. Their classification is as follows: 12 Chakravarthins, 24 Kamadevas, 9 Baladevas, 9 Vasudevas and 9 Prati Vasudevas. They are subjected to Bhavabandhasnworldly attachments. The good among them are Chakrvarthins. They are of Satwik nature. Thirthankaras are the best of men, with none to match them. The critics claim that the description of the stories of the 63 Maha Purushas is an intrinsic feature of the structure of Jaina Purana. (3) Orugallu ( Warangal), the living place of Palkuriki Somanatha, the capital city of Kakatiyas, attained name.and fame as the centre of political power and religious harmoney in the 13th century. The Kakatiyas were Jains in the beginning of the 11th century and they followed Saivism from Betaraju II, who came to power in the 4th quarter of the 11th century. We find consequently a deep conflict between Jains and Saivaities for their religious differences. Saivism was able to obtain Royal patronage and, therefore, overpowered Jainism. That was the time when Palkuriki Somanatha had taken up his pen for the propagation of Veerasaivism. Being a poet gifted with wit and wisdom, Palkuriki Somanatha had taken the reins of the times into his hands and dedicated himself to the cause of propagating religion through literature by creating a modern, popular and forceful literary form for the use of scholars and the general public as well. This is how he came to choose a popular literary form, 'the Purana'. (4) Jains are the immediate opponents of Veerasaivas. Hence, Somanatha might have keenly observed the popular Jaina Purana styles and he might have written Basava Purana with a competitive intention to surpass Jaina Puranas in all respects. He made use, at any rate, of all the structural qualities of Jaina Puranas, without mentioning them directly and produced the first Purana of Veerasaivism to the best of his ability, without taking anything away from his religious philosophy or poetic conviction. Description at the beginning of Basava Purana of basaveswara's previous birth' i.e. Asdi Vrishabha, Nandeswara and Basaveswara. Basaveswara's birth as the son of Madamba. Sangameswara performing Abhisheka to child-Basava with Jangama pada thirtha and Vibhuthi. Rejecting Upanayana and accepting Veeramaheswara Vratha. Basava's merger with Siva Linga. Jaina Puranas have opposed the tradition of Maha Purana or Marga Purana, and they have initiated their own type of Puranas with five characteristics suitable for their new form and content. Some of them were translated into Kannada from Sanskrit and Prakrit. They have become popular. Palkuriki Somanatha, being well versed in Sanskrit, Telugu, Kannada and other South Indian languages and literatures, undertook the task of producing and presenting the first Veerasaiva Purana. He observed the intrinsic features of Jaina Puranas and incorporated them into his work. Finally, Basava Purana became popular and in turn Veerasaivism also become popular in Telugu. Yet it does not mean that Palkuriki Somanatha has blindly followed the Jaina Puranas. Indeed, he has carefully chosen only the suitable techniques and adapted them for the creation of a competent literary work, a 'Purana' still, but something different from jaina Purana. The inference that may be drawn from the above discussion is that Jainism left very deep, widespread but unconspicuous and latent impact on Telugu culture. Though there are a few non-creative technical works in Telugu associated with Jainism, there is no religiously Jain literature in Telugu available today. Telugu people of the past seem to have been acquainted themselves with the Jain versions of sacred epics and certain Jain literature. But the only significant impact of Jain literature on Telugu lies in the indirect influence of Kannada Jain literature on Shaivaite literature in Telugu. Author : By Professor G. V. Subrahmanyam, Professor of Telugu, University of Hyderabad, Central University, P. O. Hyderabad-5000134. Article Source : Book "Rishabh Saurabh" Published on the occasion of Seminar on "Jaina Heritage of Karnataka, held at Bangalore ( Organised By Rishabh Dev Foundation, Delhi ) on 4th & 5th April 1994"
Copyright © 2019 jainsamaj. All rights reserved.